Sometimes I get lucky and things seem to magically appear. 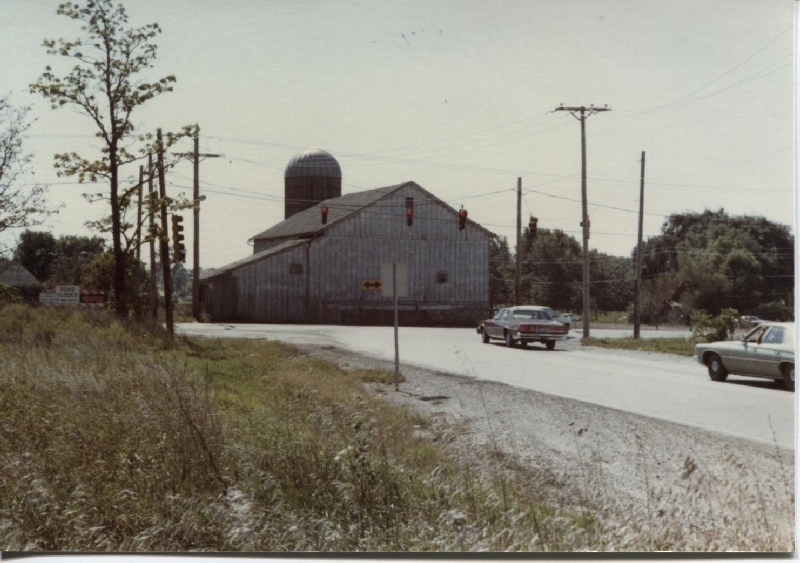 As part of a project at the library, one of our employees happened to bring in these photos of an old farm at the intersection of Schaumburg and Plum Grove Roads. Making things easy on myself, I called longtime, local resident, LaVonne Presley, to ask her whose farm this was. She quickly told me this was the Paul and Sara Meginnis farm. If you know your history of the village of Schaumburg you will recognize Sara Meginnis as the first village clerk of this community. The Meginnis farm property was first purchased as a land patent by Johann (and Sophie) Boger as identified in Schaumburg Township Land Patents by Bonnie Cernosek. After building the house in the 1850s, Johann and Sophie passed it on to their son, Hermann Boeger. 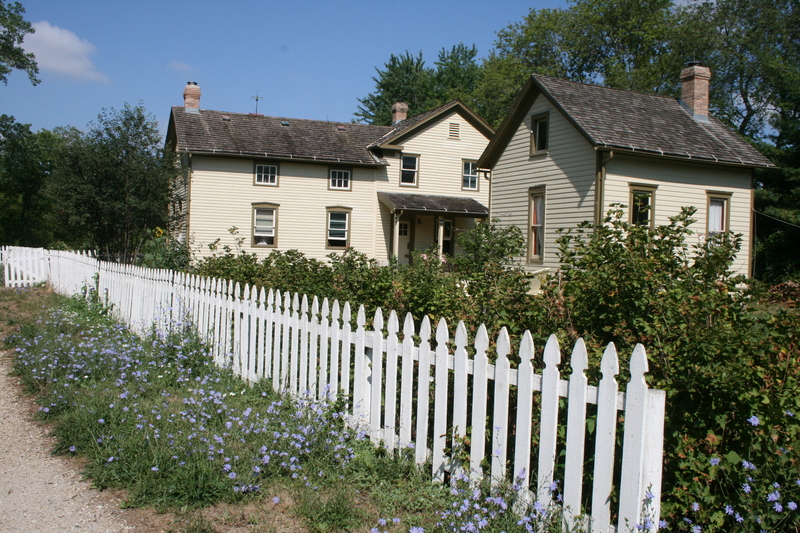 According to Spring Valley Nature Center and Volkening Heritage Farm: A Timeline, this property was sold in 1873. 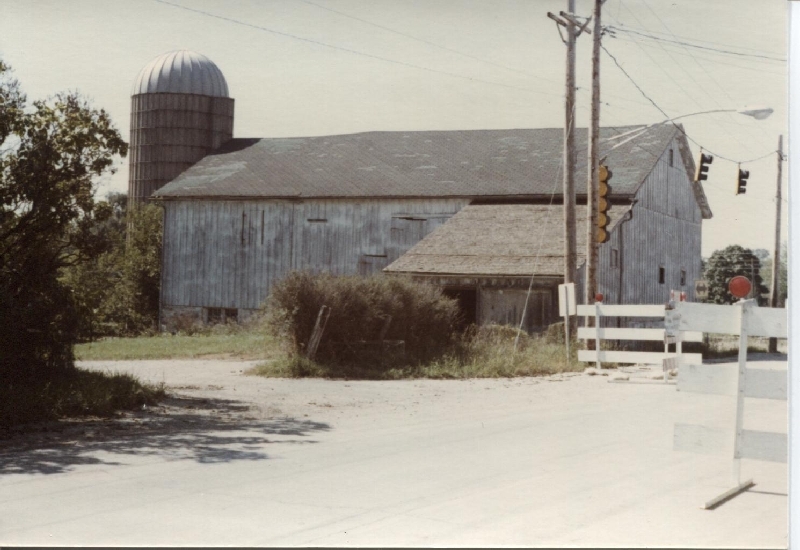 In a timeline compiled by Sara Meginnis herself, future owners were the Louis Wilkenings who owned the Wilkening Creamery located further east and across Schaumburg Road from the house. From 1908 to 1916, it was occupied by the Gustav Hammon family. Later owners were the Patla, Jaske and Krumweide families. Mrs. Anna Murphy can then be found as the owner on a 1942 plat map. [In an oral history on our library’s Local History Digital Archive, Marion Ravagnie, notes that she remembered Mr. Murphy (or his son) speeding around the township roads in a silver Lincoln Zephyr during that time period.] The farm was then purchased by Gilbert Twiss and his wife, Marjory, who were both professors and, according to Sara Meginnis lived there from 1944-1949. According to the Daily Herald, the farm then passed into the hands of Palmer and Marjorie Carlson in 1949 who, in turn, sold the 70-acre farm in 1954 to its last private owners, Dr. Paul and Sara Meginnis. They lived there with their son, Paul. Dr. Meginnis served as a veterinarian at Arlington Park and other Chicago area racetracks and Sara soon became involved with the politics that were just beginning to swirl in the township. In 1956, she ran for Schaumburg Village Clerk—and she won. Since this was also the birth of the new village, the paperwork was overwhelming and it fell into Sara’s hands to handle the bulk of it. According to an article in the Daily Herald [April 7, 1960], she was the one who ran all of the papers to the Cook County building in Chicago. After a few years of donating seven to eight hours of her day to these duties the village hired clerks to manage some of the burden. Having realigned herself with Mayor Bob Atcher’s Schaumburg United Party for the 1959 election, Sara served until 1963. Dr. Meginnis served as a Schaumburg Township School Trustee and on the village’s early planning board. Sara was active in the formation of Spring Valley Nature sanctuary and also became one of the founding members of the Schaumburg Township Historical Society along with Loie Wiley, Dru Linnell and Elaine Hertwig. Until 1979, Dr. and Mrs. Meginnis lived on the farm they called “Taraday”. At that time, the Cook County Highway Department approved a project to straighten Plum Grove Road which made a jog at Schaumburg Road. As is obvious in the photos, a number of the buildings bordered the road and made it necessary to demolish them for construction. 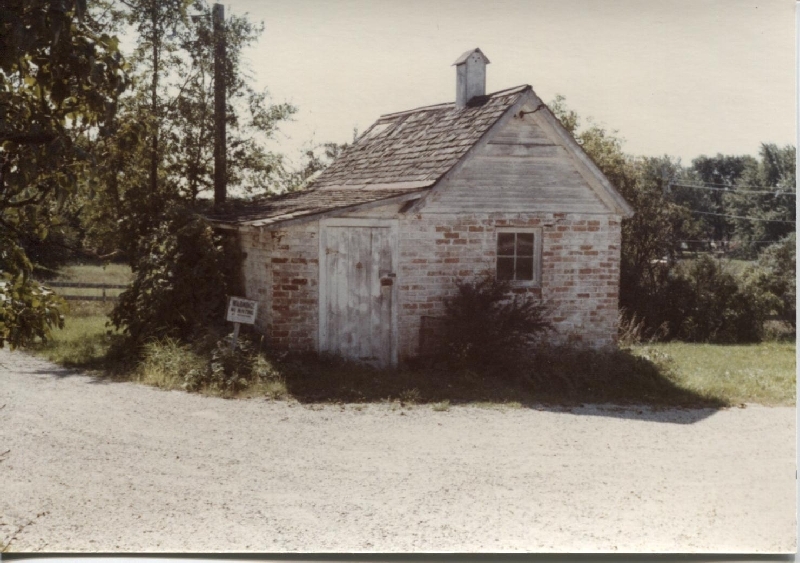 Fortunately, efforts by Ronald Rood, Alice Whyte who was active in the Schaumburg Historical Society and a member of the Olde Schaumburg Centre Commission and Ellsworth Meineke’s son David, who was active in the Spring Valley Nature Club, rescued the original Boeger home on the property. Through their efforts, the Schaumburg Park District board agreed to provide up to $15,000 for half the cost of moving the house. The Woodfield Bank also agreed to provide interest-free financing for any additional funds. [Daily Herald, May 18, 1979]. The house with its two additional wings was then moved to its current location on the Volkening Heritage Farm. It now serves as the farmhouse for the 1880s operating farm–which sits on original Boeger land. According to longtime volunteer, Sandy Meo, the north section of the house as you walk into the kitchen is the oldest portion of the house. The part of the house that the Heritage Farm refers to as the “grandparents’ section” was added on to the house at a later date. It is the same layout as the original house with its one large room and two smaller rooms. They have not been able to determine where this addition came from or when it was added. From the outside of the house, the architecture of the two sections is markedly different. As Sara Meginnis was quoted in a May 12, 1979 issue of the Daily Herald, “I’m so glad they’ve found a way to save those buildings. There’s so little left of the beauty and simplicity of those days gone by.” But the village hasn’t forgotten Sara or her home. 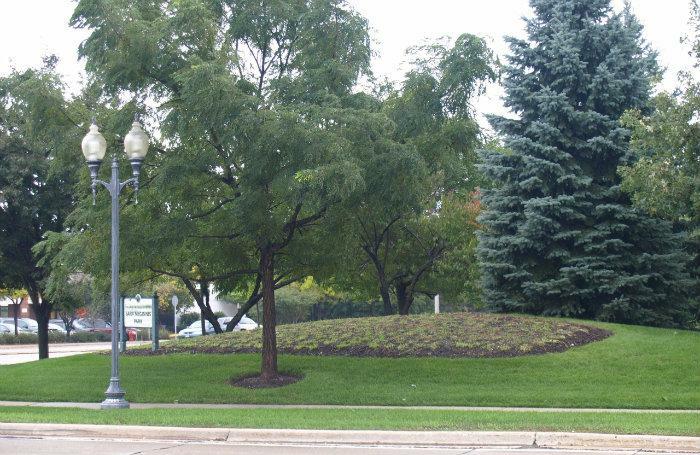 In August 2001, the park on the SW corner of Schaumburg and Plum Grove Road was named Meginnis Park in her memory. How fitting that it is across the street from the former Meginnis property. My thanks to S. and C. Herrmann for generously donating these photos and, having the foresight to acknowledge history that would soon disappear. My thanks also to Tom Helsper, who brought it to my attention that the land Meginnis Park is on was part of a 9 1/2 acre parcel that his grandparents, Walter and MayBelle Helsper, purchased from Palmer and Marge Carlson in 1954–the same year they sold to the Meginnis’s.